Fifty Rio Grande wild turkeys sporting shiny and colored leg bracelets are roaming the woods this spring in Llano and Mason counties. Some have designer backpacks and state-of-the-art electronics. They are not trying to be fashion statements; they are participants in a high-tech information exchange. 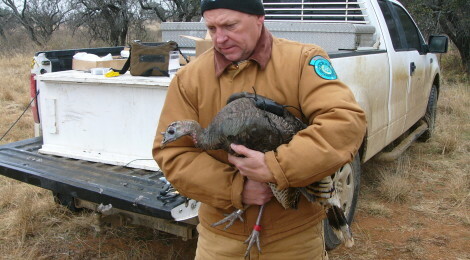 Earlier this year, Texas Parks and Wildlife Department biologists working closely with local landowners trapped, tagged and outfitted these birds with GPS tracking devices for Rio Grande wild turkey fieldwork to identify specific habitat characteristics of nesting, brood-rearing, loafing, and roosting sites. “We will also look at dispersal rates and distance traveled between winter and summer ranges,” said Kory Perlichek, TPWD’s district biologist in Mason. The project consists of three turkey trapping sites on private land in eastern Mason and western Llano Counties. Trapping began in February using funnel traps and drop nets. Among the 50 turkeys captured, which included hens, gobblers, jakes, and bearded hens, a dozen of the hens were fitted with GPS-VHF backpack-style radio transmitters. Local landowners and biologists alike are interested in how this high-tech information can improve land management decisions. Basic biological data was collected on all birds and leg bands were placed on each prior to release where they were trapped. Silver bands were placed on the right leg and a colored band on the left leg of each bird. TPWD phone numbers are on each leg band and radio transmitter. If anyone recovers a wild turkey with a leg band or radio transmitter, please contact the phone number listed on the item or contact Kory Perlichek at 325-347-5691. All birds with radio transmitters will be monitored once a week prior to nesting and more frequently during nesting season. Nesting season for the Edwards Plateau is typically from April to July each year depending on habitat conditions and the timing of spring green-up. Previous work in the Edwards Plateau, where Rio Grande wild turkey populations have locally fluctuated, has not focused on populations in the Llano Uplift region. While these populations appear stable, changes in land use practices in this area and the effect on habitat use and productivity are unknown.